Women and people from marginalized populations need well-functioning courts to realize their potential, research in Bangladesh and India has found. What happens to small and medium-sized businesses when the legal system doesn’t work? The story of one businessman, interviewed by Anirban Mukherjee, assistant professor at the University of Calcutta, illustrates the effects of a faulty system. Unable to get paid after supplying garments worth 1 million rupees (approximately CA$19,400) on consignment to a seller, the man approached lawyers to see about recovering his money through the courts. They told him he would have to spend twice the amount due in legal fees, and that the process would likely take 10 years. 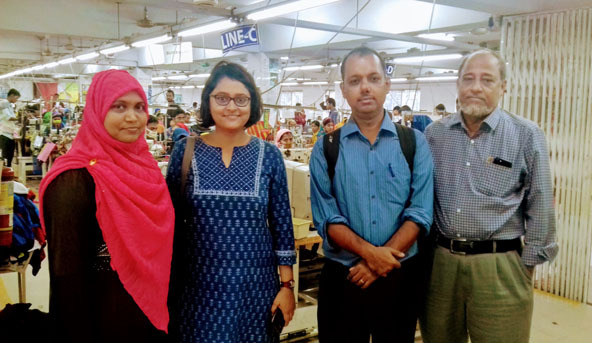 Tanika Chakraborty (second to the left), assistant professor at the Indian Institute of Technology in Kanpur, and Anirban Mukherjee (second to the right), assistant professor at the University of Calcutta, visit a Bangladeshi garment factory. Now twice shy, the businessman relies on the trusted retailers and suppliers he knows through informal networks and is reluctant to expand his business with new and potentially better partners. Anirban Mukherjee tells the story of a garment trader in Kolkata who doesn’t feel he can rely on the courts to protect his business. Mukherjee’s interviews are part of IDRC-supported research on the courts, other institutional barriers, and their effects on small and medium-sized entrepreneurs, especially women and people from marginalized castes. Led by the Indian Institute of Technology Kanpur, the project examines formal and informal contract enforcement in India and Bangladesh using official survey data, interviews, and case studies. The researchers found that women and people from lower castes in districts with better functioning courts are more likely to own businesses than in districts with weaker courts. The inefficiency of the legal system is forcing entrepreneurs to seek contract assurance through informal networks shaped by family, ethnicity, gender, and caste. When business is carried out through these networks, composed mostly of men, women are often excluded. A well-functioning court system makes it possible for women to enter into formal contracts, requiring lawyers and special stamps, and to protect themselves from breach of contract. The same is true for other entrepreneurs who do not have family or community connections to facilitate their market entry. explained Tanika Chakraborty, assistant professor at the Indian Institute of Technology. Listen to Tanika Chakraborty explain the research project and its focus on women. These emerging findings can help policymakers adopt the best measures to empower women, reduce inequality, and create jobs. They also show that, for businesses, investing in formalization only pays off if contract enforcement is effective. Policies aiming to encourage businesses to operate in the formal economy must also look at the courts to achieve their goals. States across India have different legal structures with varying impacts on entrepreneurship. Results even vary within states. For example, data from West Bengal demonstrates that courts in southern districts are less efficient than those in northern districts, and that inefficiency has increased every year since 2001. The research team is building a national index on quality in the legal systems over time and across Indian states that reflects the courts (speed of justice and the costs to access them) and their impacts on entrepreneurship (the number of businesses in the state and the number of businesses owned by women and people from marginalized castes). The index will compare 12 states across the country to the national average to highlight regional differences and improve understanding of why these differences occur. Preliminary data shows that long case backlogs lead to delays in judgements and discourage people from filing new cases. The researchers argue, however, that efforts to speed up resolutions should focus on new cases. States that resolve more new cases, rather than concentrating on old cases, saw a greater number of fresh cases filed in 2013. These recommendations are crucial to improving the business climate for vulnerable populations in South Asia. Informal networks are a poor substitute for well-functioning courts because they only work for insiders. They exclude people with business acumen who lack family connections, and they force others to take up an occupation based on the network they belong to rather than natural inclination and talent. When this happens both economic growth and equal opportunity suffer.